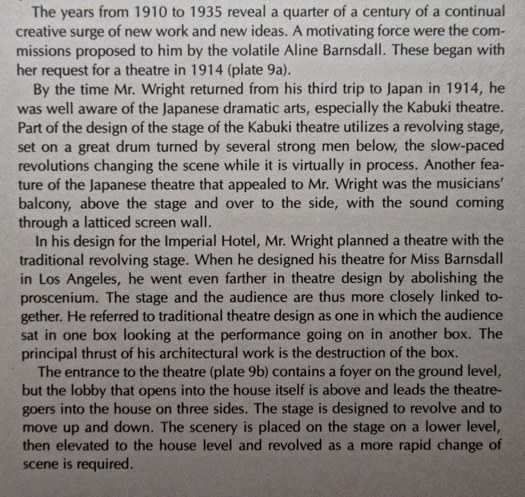 Hi I am, in addition to being a fellow Wright enthusiast, a professor of Theater Design. 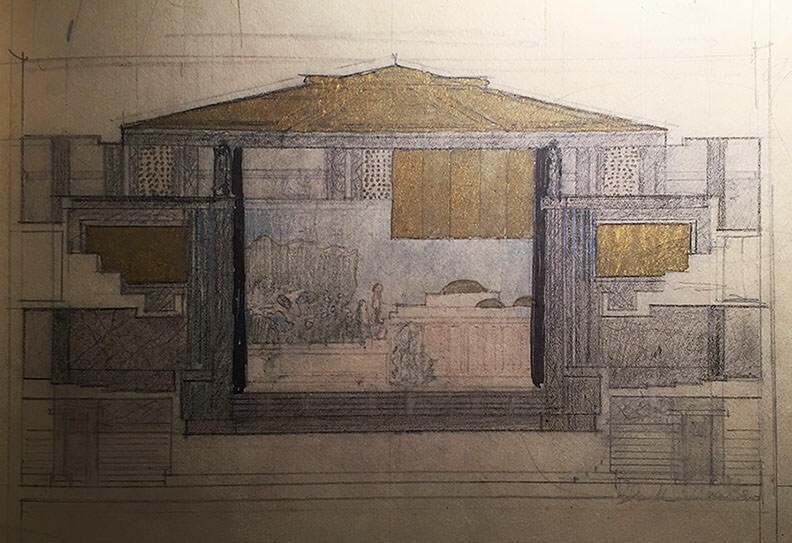 I am trying to compile a list of various theater buildings designed by both Mr. Wright and the Taliesin Associated Architects. Should I track down the Monographs and just comb thru them looking for theater Structures? That won't be necessary; we'll come up with a definitive list here. I'll wait for others to contribute suggestions, then (if necessary) complete the search and make a list. Offhand I'll guess there are no more than a half-dozen . . . Churches have more than a little in common with theaters. If we were to add those the list would suddenly swell. Kalita Humphreys/ Dallas Theater Center - Based on a 1931 proposal for Woodstock NY. The Kiva at Taliesin West was used to show movies, and might not count. 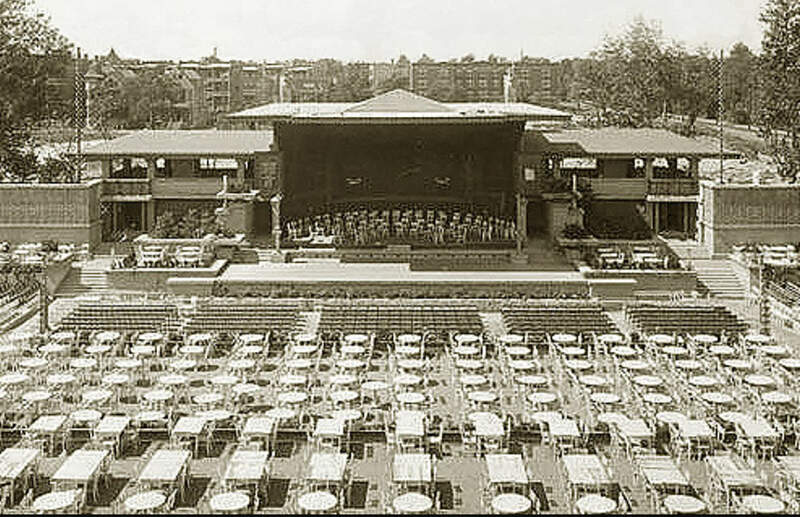 Did Midway Gardens have a stage? San Jose Center for the Performing Arts, by TAA, looks like a knockoff of Gammage. 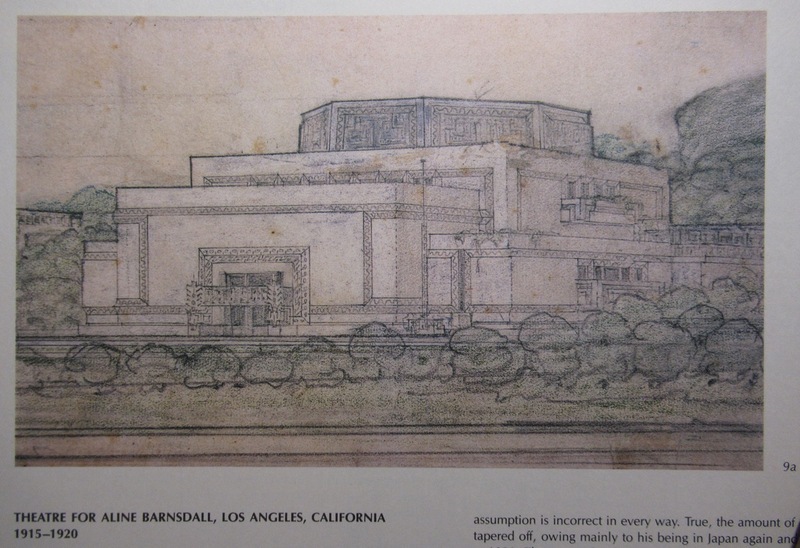 Theater, never built, for Aline Barnsdall's property in LA. The Coonley playhouse has some interior steps that made the upper part a stage for the children's performances. 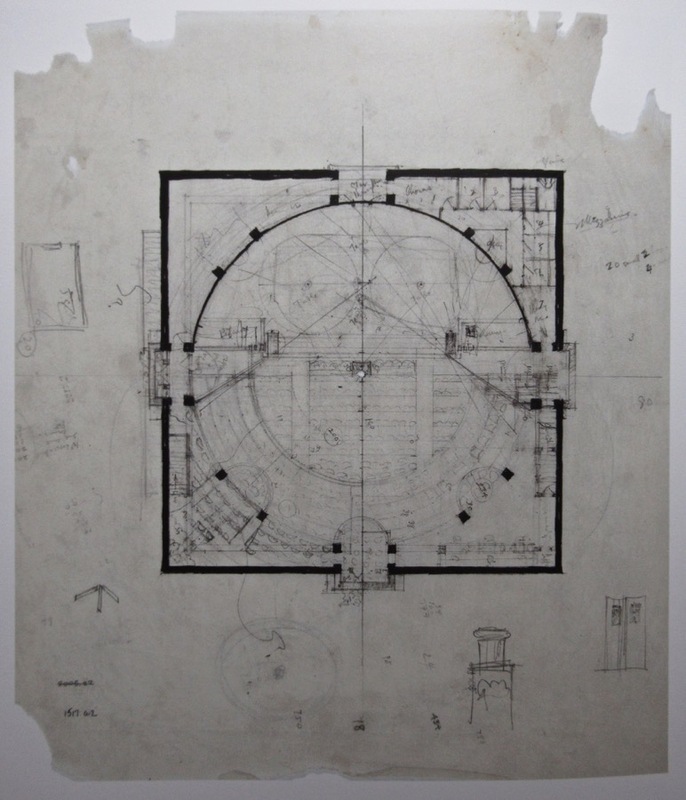 He might have designed a theater while in Tokyo (or was it a sumo-wrestling stadium?). 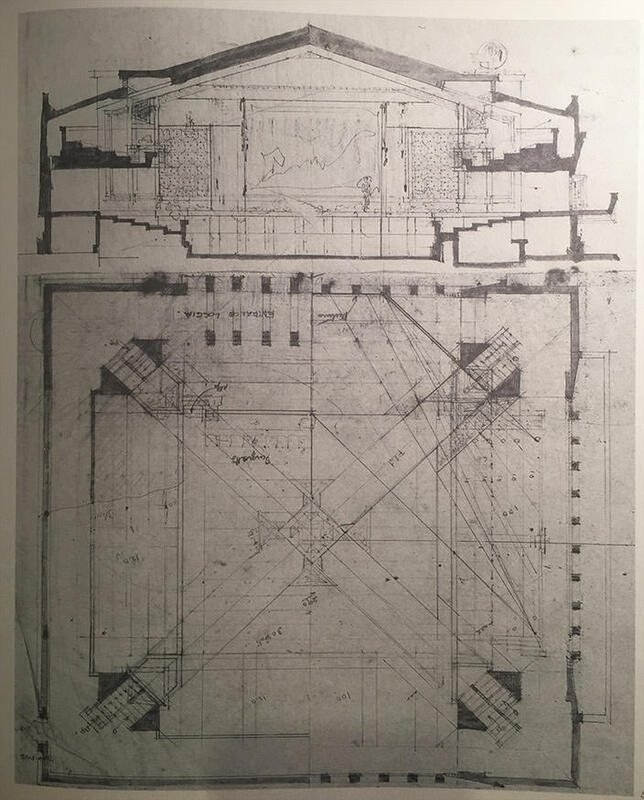 Legend is that the roof over the Hollyhock loggia was a stage, with the central courtyard a place for the audience, and that Martha Graham performed there, but the legend hasn't stood up under examination. 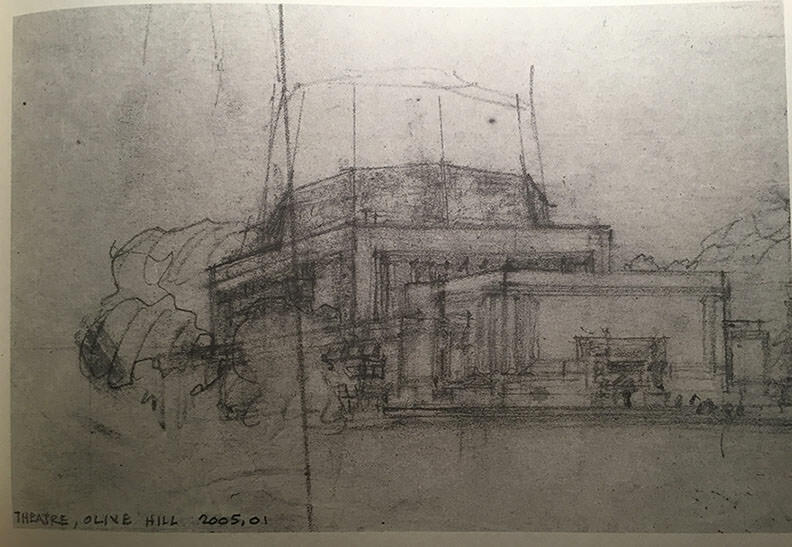 Opera House design for Baghdad, which may have been the precursor of Gammage. The theater at Taliesin (North) hasn't been mentioned. "kindergarten-community theatre" for the same property. Even without the work of TAA, my initial estimate is looking like a slight on the reality ! 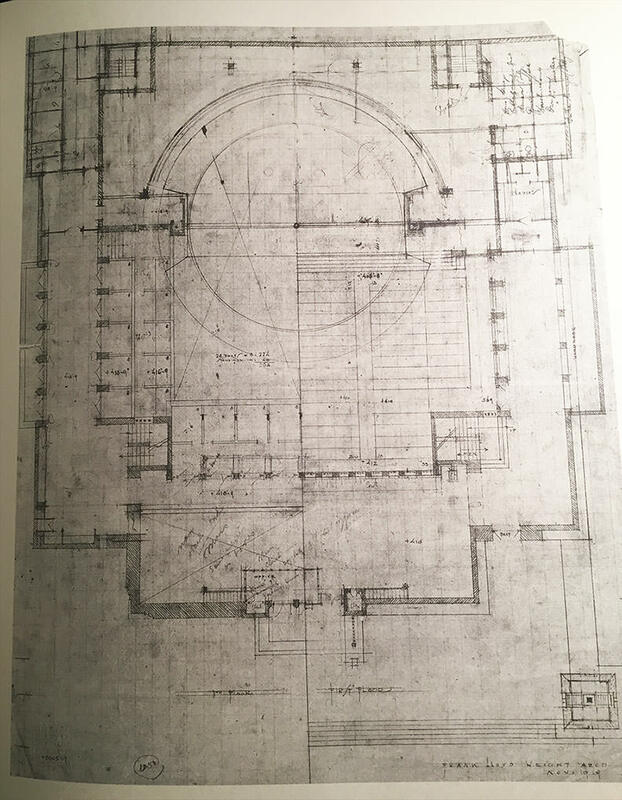 A sub-task will be listing the built vs the unbuilt theaters . . .
Tucson Creative Dance Center by John Howe while with TAA might be considered. 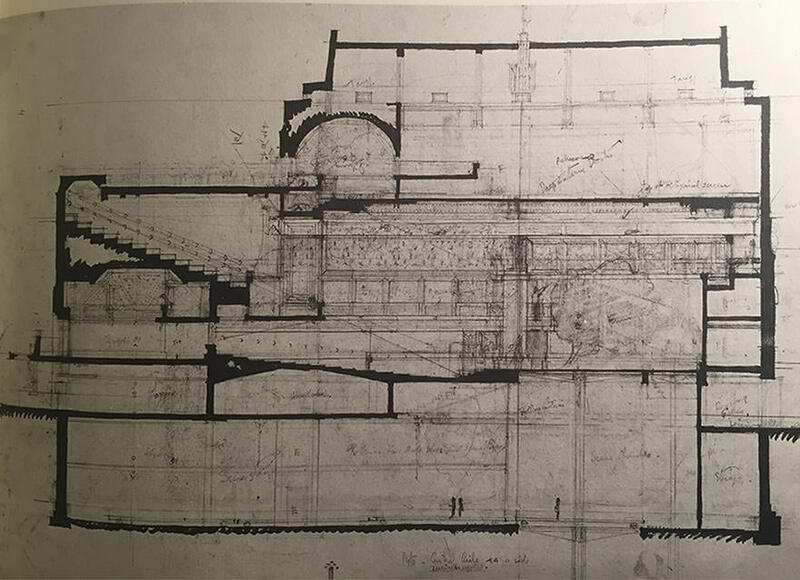 Photographs of said models do not appear in "Treasures," in the Monograph, nor in Taschen I, which has even less on the theater project than is found in Monograph 4. 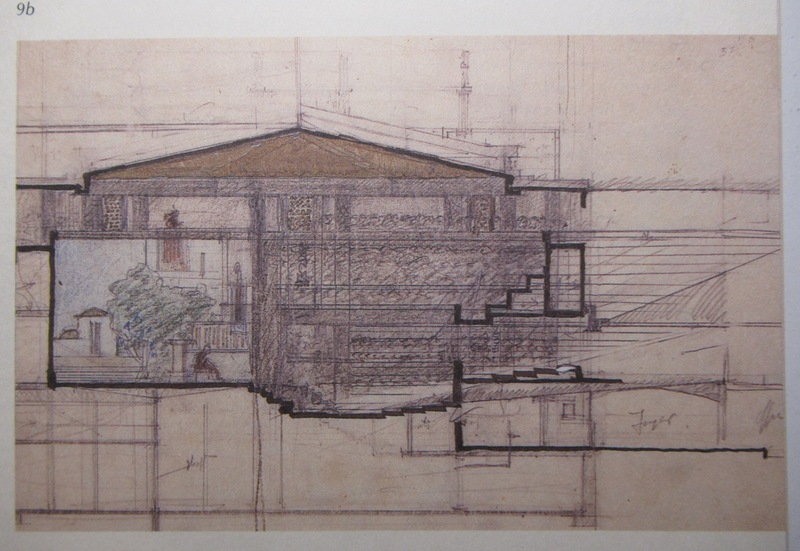 There is is Taschen, however, this additional plan drawing . . .
Also. the Van Wezel Performing Arts Hall by TAA, in Sarasota, FL. There's the Wes Peters/TAA designed Bartlesville Community Center, across the street from the Price Tower. Gracious. I never saw that version of the bowl. Look at the giant planter urns. Lloyd was the only one who could take his father's bits and pieces and exaggerate them to good effect -- usually. There were a theater and a cabaret in the Imperial Hotel. Wasn’t there a motion picture theater project for California at about the same time as Midway Gardens? 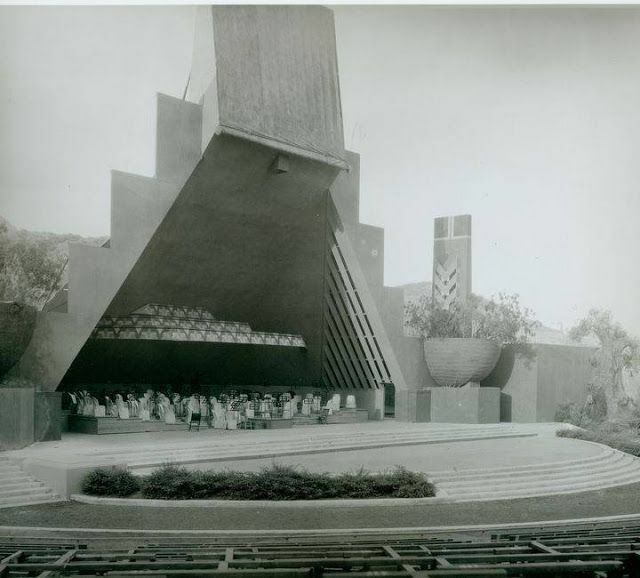 Then there was the Michael Todd theater prototype in the 1950’s. If amphitheaters count, there was one proposed lakeside at Florida Southern for water events. Also, one in the grand scheme for Pittsburgh Point Park and one proposed for the Marin County Fairgrounds. Later the TAA designed Marin Veterans’ Memorial Auditorium by TAA was built at the fair grounds.